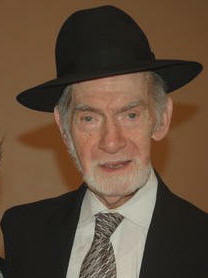 The Queens Jewish Center mourns the loss of RABBI JOSEPH GRUNBLATT on November 23, 2013 at age 86. He served as Rabbi of the Center from 1967-2006 and at his death was Rabbi Emeritus. Rabbi Grunblatt was beloved and highly respected within the larger Jewish community and was regarded as a Rabbi’s Rabbi. Rabbi Grunblatt was born in Leipzig, Germany and spent the war years with his parents in London where he attended the Etz Chaim Yeshiva of Rabbi Elyah Lopian. After coming to America in 1944 he attended Mesivta Torah Vodaath where he studied under Rabbi Reuven Grozovsky and was ordained in 1949. He also earned degrees in Political Science and Education and was awarded an honorary Doctor of Humane Letters degree from Touro College in 2003. Prior to his coming to the Queens Jewish Center in Forest Hills, Rabbi Grunblatt served pulpits in Saratoga Springs and Montreal. A prominent lecturer and community activist, he had served as Vice President of the Rabbinical Council of America, President of the Vaad Harabonim of Queens and was active in the Orthodox Union, NCSY and as advisor to collegiates. He also taught at Yeshiva University and Touro College. He authored Exile and Redemption which was published in 1988. Rabbi Grunblatt leaves his wife, children and numerous grandchildren and great-grand children. He and the late Rebbetzin Esther had three children: David, an immigration attorney in New York; Rabbi Akiva, a Rosh Yeshiva of Chofetz Chaim in Queens and Chana Leah Merling, a special education teacher in Montreal. At his death, Rabbi Grunblatt was married to his second wife Rebbetzin Bella, whose two daughters Sara Osina and Mashie Tendler and their families were devoted as his own.